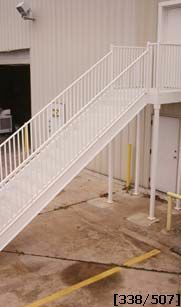 This ten foot tall stair is a 48" wide straight stair with landing and support columns. It has 16 risers at 7 1/2 inches and a tread run of 11 inches. The handrail is # 200 (1 1/2") round tubing, and balusters are a # 302 (1") square tubing with less than four inch spacing. The landing is a 48"x 48" square with rail sides to match the stair. Stair has four 3" ID schedule 40 support columns that slide into a 3 1/2" ID schedule 40 sleeve affixed to the bottom of the landing. It can either be bolted or welded together. Stringers and landing frame are made out a MC 10x8.4 heavy duty channel, are fabricated in one section, and bolted or welded to the landing at the job site. Finish is primer white with finished paint applied at the job site.